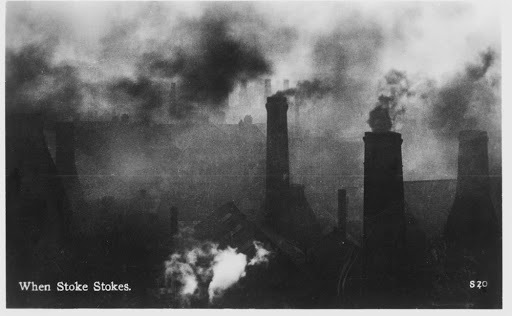 Writing about Wedgwood reminded me of the postcards that you used to get in the North Staffordshire Potteries showing the town enveloped in smoke from bottle ovens, with ironic captions like, “Fresh air from the Potteries” and “Beautiful My Country”. This series of postcards was published in the 1950s by Shaws of Wolstanton, though the photos are at least fifty years older. Shaws had the negatives and the cards are marked “Guaranteed real photograph”. The company got good sales from them for a long time, obviously appealing to self-deprecating potters and amused visitors. 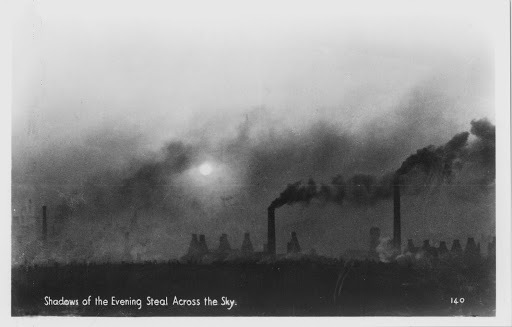 When these postcards were circulating, bottle ovens had already been made obsolete by the rising price of coal and the Clean Air Act of 1958. Electric tunnel kilns had been in use from the 1920s and they were common after 1950. 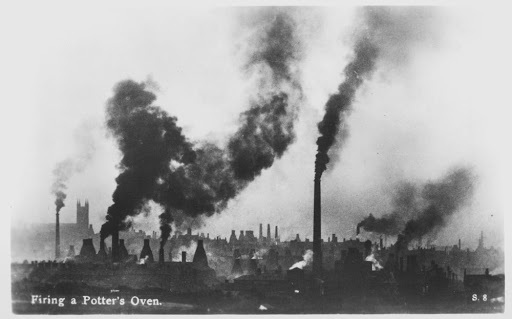 Bottle ovens were incredibly wasteful, 95% of the heat going up the chimney and only five per cent reaching the pottery. 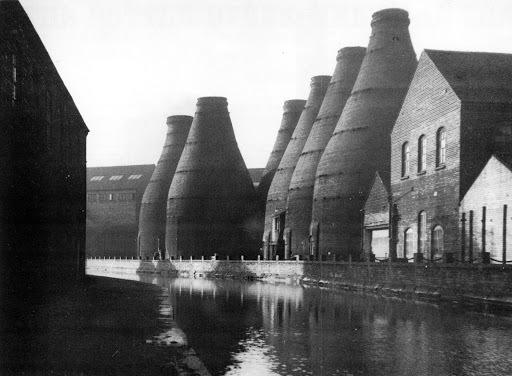 There were once four thousand bottle ovens in the Potteries. By 1950, two thousand were still in use. By the end of the 1960s there were none. Forty-seven remain, listed buildings and museum-pieces like the one at the Gladstone Pottery Museum. As these coal-fired kilns were being pulled down, Donald Morris, a local school teacher, was rushing round with a camera, recording them as they disappeared, once arriving minutes after one of them had been demolished. Below is one of his atmospheric pictures, taken in Longton in 1958 before the site was cleared for a shopping precinct. In the 1960s, some of Morris’s photos were published by students at Keele University in Unit magazine, of which I was art editor. Two years later, under Tony Elliott’s direction, Unit went to London and morphed into Time Out. 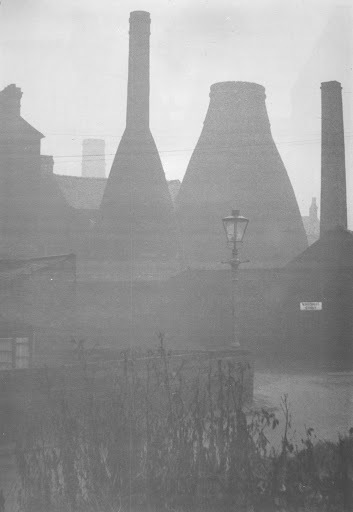 Thirty years later, Morris finally published his collection of photos in The Potteries – A Photographic Record. What you see of a bottle oven is the outer skin, or hovel, protecting from the weather the fire-mouths within. Thousands of pots were placed within the inner cavity and the flames were drawn up through the wares by the chimney draught. To keep them clear of coal ash, the pots were put into fireclay boxes, called saggars, which were piled on top on one another in the kiln in a tall column. Saggars being placed inside a bottle oven. Each full saggar weighs about 25kg. 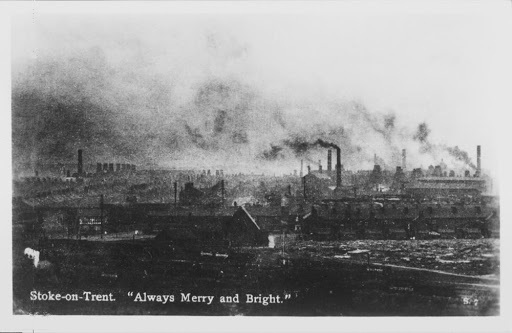 One of Morris’s photographic subjects was Fred Boulton, a saggar maker. His job was to shape the walls of the saggar round a wooden former and then attach it to the base. And, yes, there was indeed someone called a saggar maker’s bottom knocker – the saggar maker’s less skilled assistant who hammered out a lump of clay to make the base for him. Pottery jobs were advertised in the Evening Sentinel. But you couldn’t find a job for anything as simple as a potter: you had to be a sponger, a dipper, a cranker, a fettler, a jollier, a pencil-bander, a blunger charger, a cup-mould runner, a large flat maker, a dust grinder or a back stamper. 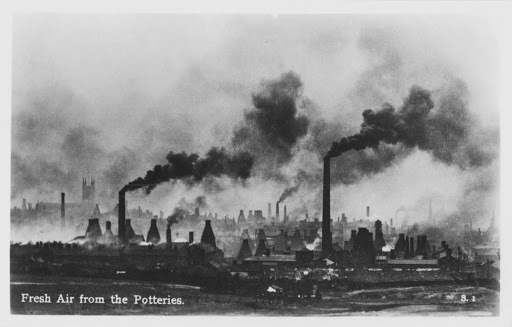 As a result of specialisation and long practice, craftworkers in The Potteries had extraordinary abilities. A thrower making teapots on the wheel, for example, could make seven in five minutes. No studio potter could approach these people’s skill. Specialization, by the way, has been a feature of pottery making from time immemorial and the “peasant potter” who did everything himself is a myth. The small workshop in which there is no division of labour is wholly a creation of 20th century studio pottery. 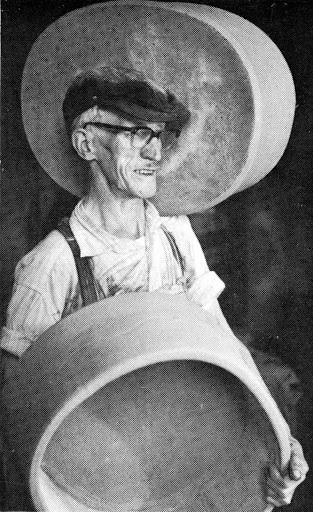 The uniquely satisfying nature of traditional craft work is also a myth, for pre-industrial potters often had to mass produce by hand at great speed, working for long hours in filthy conditions. 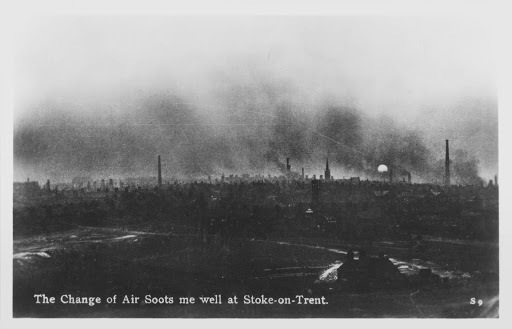 People used to say that the Potteries’ great misfortune was that it wasn’t bombed in the war. In 1970 it still had old-fashioned buildings and old-fashioned industries. In the 1980s there were government attempts at regeneration, notably the Stoke on Trent Garden Festival. Now pottery employment has almost completely disappeared. In 2009, fifteen hundred jobs were lost at Wedgwood. Much tableware is now imported from China. 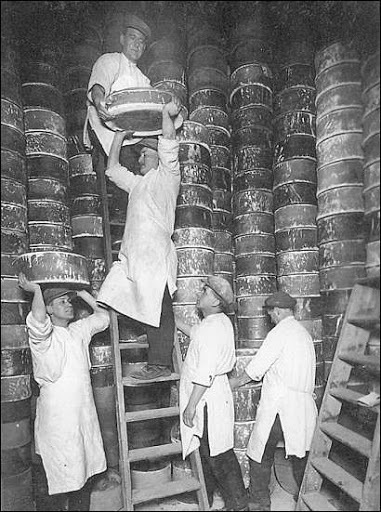 However, in line with other manufacturing industries in Britain, the pottery industry has increased productivity, and I was told recently by the owner of small pottery in Stoke that although there were now few potters, the output of pottery is as high as ever. Burslem, once grand in small way, looked to me on a recent visit, with all its demolition sites, as if it had been bombed. In Hanley, at the old Meakins works, Emma Bridgewater, making her cheerful and popular tableware, is one of the few local entrepreneurs to buck the trend, ensuring continuity of employment for spongers , fettlers, jolliers, back stampers, and maybe even saggar-maker’s bottom-knockers.